The first inhabitants of St Maarten were Arawaks, a South American tribe from the Amazon Basin that spread north through the Caribbean and settled on the islands. Archaeological finds unearthed at Arawak settlements such as Hope Estate point to a first wave of settlers as early as 200 - 300 B.C. and later occupation from A.D. 300 to 500. Peaceful Arawak fishing and farming villages later fell prey to the warlike Caribs, another South American tribe that swept through the Caribbean in the 14 th century. The Caribs baptized St. Maarten 'Soualiga' or 'land of salt' in reference to the island's naturally occurring salt pans. Legends tell that Christopher Columbus discovered the island in 1493, however, it is much more likely that the island he spotted from the distance was actually Nevis. St. Maarten first appeared on a map in 1516 with the name Sam Mtim and was a Spanish territory by that time. The Spaniards called the island San Martin, in honor of Saint Martin of Tours, although they never colonized it. The island was uninhabited until 1631 when the Dutch founded a trading post, built Fort Amsterdam and began to harvest salt from the coastal lagoons. A handful of Frenchmen also settled in the north of the island. The Spaniards expelled the Dutch in 1633 and built a second fort. In 1644, a Dutch expedition led by Peter Stuyvesant (who later became the first governor of New Amsterdam, the site of New York) tried unsuccessfully to retake the island. The Spaniards abandoned the island in 1648, leaving the Dutch and French to fight over it. Despite signing the Treaty of Concordia in 1648 which partitioned the island between the two nations, they continued to dispute it throughout 18 th century. 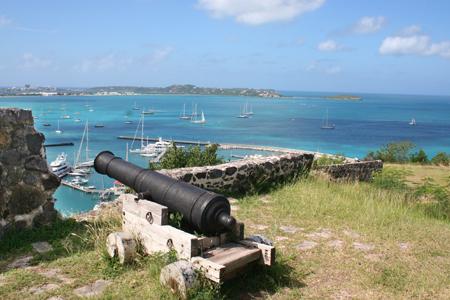 In fact, St. Maarten changed hands 16 times as the Dutch, French and the English vied for control of the Caribbean. The current border between St. Maarten and Saint Martin was set by the 1817 Treaty of Paris. During the 18 th and 19 th centuries, the island was a plantation economy, producing salt, indigo, cotton, tobacco and, most important of all, sugar, although never on the scale of other Caribbean islands due to a combination of poor soils and a lack of fresh water. Slavery was abolished in Saint Martin in 1848 and in St. Maarten in 1863. The island economy went into decline until 1939 when St. Maarten was declared a duty-free port. During World War II, the Allies occupied the island and built a military airfield, now the site of the Princess Juliana Airport. Tourism began in St Maarten in the 1950s.